I have grey hair. The consensus is that its due to my two teenage daughters. Because I have teenagers, I spend too much time considering their college education, the impending cost of which is the largest contributor to my grey. Boyfriends aren’t helping either, but I think I have it in check by reenacting this masterclass performance, sometimes minus the expletives, by Martin Lawrence and Will Smith in Bad Boys II when meeting a potential suitor for the first time. 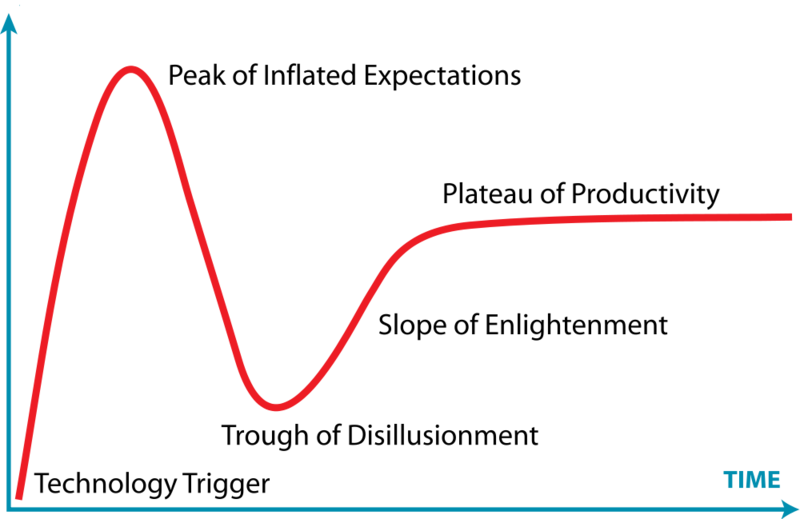 The Gartner Hype Cycle is the trajectory of expectations over time that can be applied to everything from the process of bringing a new Collections Management System into your institution, to the trajectory of a disrupting innovation like MOOCs. And so, to prevent languishing in the Trough, your institution begins the steady climb up the Slope of Enlightenment, which should probably be renamed as the Slope of Begrudging Acceptance and Finger Pointing, to the Plateau of Productivity, which itself should be renamed as the Plateau of Making Do Until the Upgrade. There’s no question that MOOCs are a disrupting influence, sites like Udemy are clear in their mission to “democratise education”, but for them in particular, its a partially democratised education, with some popular courses costing a capitalistic $500. There’s no question that there is a problem with our education system, and museums have a very definite role to play in the solution. There is a high expectation that MOOCs offer some kind of Panacea, but while there are some headlining MOOC success stories, with claims of hundreds of thousands of students taught (how ever you want to define that), I would say that MOOCs have experienced their Peak of Inflated Expectations, and are about to make that inevitable descent into the trough of you-know-where, as reports such as Doubts About MOOCs Continue to Rise begin to emerge. As an observer of, and player in, the museum field’s transition to digital, and the tortuous conundrum of trying to figure out what it means to serve an audience who may never visit your museum, I find the emergence of MOOCs fascinating. Even after 20 years of debate, wailing and gnashing of teeth, most museums have still not fully come to terms with an online-only audience. And this is the very same dilemma that the Education system is about to face: what does it mean to educate an audience that will never visit your college? In the same way that museums have to think differently about their online audience, so it is with online education, in fact it can and should be a better and richer experience than a “live” education, by integrating the plethora of resources available on the web, implementing rich media and interactive functionality, creative hangouts with students across the world to self-organised learning and teaching. But as we are now discovering, as museums think about print versus digital and physical versus online visitors, the reality is that a distinct separation should not exist, we should look to create rewarding digital interpretive experiences whether on or off-site, its about situation not location. Similarly, I think the Plateau of Productivity for online education whether its MOOCs or not, is about no distinct separation but a blend, a combination of online and physical. We’re already starting to see online courses climb the Slope of Enlightenment by requiring attendance to a two week on-campus seminar, I think we’ll start to see this extend to a summer semester, so that regular onsite courses aren’t disrupted. An unwillingness to shoulder significant debt, may encourage more young adults to forgo college at 18 and leap straight into the workforce, trusting that the portfolio of accomplishments they build will be a good substitute for a traditional degree when they apply for later positions. In the end, employers control whether and how fast these alternate modes of training and credentialing catch on. As soon as employers show they are willing to accept online courses (even free ones) and portfolios of independent work in lieu of traditional degrees–well that sound you hear is the foundation of the ivory tower, cracking. Wait… That means boys. Maybe there should be online-only degrees, and my daughters don’t need to go away, and a virtual degree is not virtually a degree, and the cost is much less, and my grey will disappear. I have great expectations.